The Atlanta Poker Club is Coming to Conyers! Attention Poker Players! We are coming to Conyers at the Truth Sports Bar and Grill! The first game starts on 1/9/2017 with a guaranteed $100 freeroll (details here)! We hope to see you there every Monday at 7:30pm! It is 100% FREE to join the APC! It is 100% FREE to play poker with the APC! There is 100% NO GAMBLING. Ever. New players are welcome to join at any time. Join Us At Our Brand New Venue In Conyers on 1/9/2017! New players please help us kick off our expansion into Conyers Ga with the Truth Sports Bar and Grill starting on Monday, January 9th at 7:30 PM. Get there early and play in our fun pre-game. We look forward to see you all! In no particular order, here are the top 10 reasons to pick the Atlanta Poker Club for your free poker league in Georgia. 2. Our games are well organized, fair, friendly and fun. – Our style of poker is designed to let you play “real poker” and not “bingo poker” that you will find at most nightly poker games. 3. Awesome dealers take care of the table the entire time. You can just show up and play knowing that someone else is handling the cards. Or you can get trained to deal from the best dealers in the league and our own Tami D who previously dealt at the Bellagio in Las Vegas. 4. We offer the best value in prizes. You have a real shot at winning cash and prizes every time you come out to play AND there is always a league competition you can compete for. From nightly giveaways to the once per year mega prizes and everything in between there is always something to compete for with the APC. 5. Well trained Tournament Directors. We have someone on site that operates and runs the tournament for you. They are not playing in the game themselves but are there to make sure the event runs fairly and smoothly. We encourage our TD’s to treat players like gold. – Come out and play and see what you think. 6. We include poker games like Pot-Limit Omaha at some of our venues. 7. VIP program is the best deal by far for VIP’s. Compare for yourself and you will agree. 8. You can’t buy your way to the final table – even if you are a VIP (no double chip ups for purchases for VIP’s or crazy big bonuses). 9. Competitive, rewarding and prestigious league competitions each season – Can you win an APC silver coin like our Champions? 10. The other players will become your friends and family. For over 13 years now the APC has been the place where countless friendships, relationships and marriages have been formed. 11. BONUS Reason #11 – Free APC T-Shirt! Bonus Reason #11 – New Registered Players Play 5 Times And Get A Free APC T-Shirt! 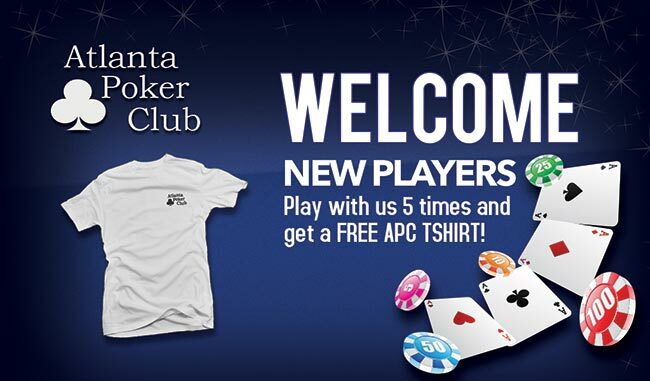 It is 100% free to join and register with the Atlanta Poker Club and it is 100% free to play in all of our events. New players who register as a member and play with us 5 times will get a free APC t-shirt! Come give the Atlanta Poker Club a try. We would love to have you join us at the tables. You can find a venue near you by viewing our where to play page. We are big enough to put on awesome special events and small enough that you have a real chance of winning. We think you will love the APC once you play with us a few times. See why so many others have made us their poker league of choice. Come out and play with us tonight!